You’re not driven by greed or after wealth simply for wealth’s sake. Instead, you probably want to grow your wealth substantially to achieve goals that are deeply meaningful to you. 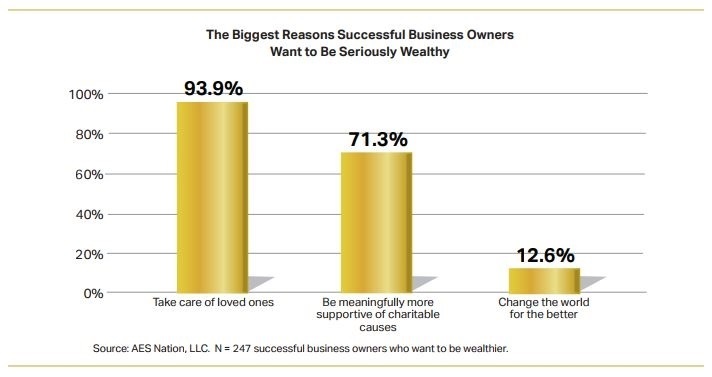 As the chart below shows, these goals likely include taking care of your family and other loved ones, supporting the causes you care deeply about and perhaps even changing the world for the better. To make those goals real, you’ll need to determine the amount of wealth you’ll need to reach them. Whatever your amount is, if it enables you to achieve all that is most important to you and your family, we call it serious wealth. It takes discipline and focus to become seriously wealthy. We have evaluated the attitudes, behaviors and actions of self-made billionaires and have identified some of their most pronounced, dominant and persistent patterns— the Billionaire Money Rules. These seven rules encapsulate the key mindsets and strategies that you may want to consider adopting yourself. #1. Commit to extreme wealth. Truth be told, many people would like to be rich but have not committed the time or effort to get there. Following this rule means having a clear sense that money is a critical—if not the critical—objective. #2. Engage in enlightened self-interest. #3. Get in the line of money. Some endeavors make more money than others. Where the self-made Super Rich choose to apply their skills counts. For instance, they know they’ll have a greater chance of attaining wealth by being their own bosses than by working for somebody else. Following this rule means pursuing fields and initiatives that offer the highest paybacks, now and in the future. When building teams, the very wealthy assume everyone has a degree of self-interest that can be used. They never assume people are willing to work solely for satisfaction or fulfillment, and therefore they reward handsomely—with cash, equity or some other form of currency—to cultivate the loyalty and specific behaviors that can help them reach their long-term goals. #5. Connect for profit and results. Highly successful people think about networking as a means to an end: finding the person, information or tools that get them one step closer to their goals. Following this rule means maintaining a small but deep network of relationships that may lead to friendship, but that certainly will lead to power and influence. #6. Use failure to improve and refocus. Failure is often inevitable, so most of the very wealthy don’t worry about avoiding it. Instead, they focus on learning from each experience and using the lessons to get an advantage the next time around. Rather than obsessing about lost opportunities and getting discouraged, they study their failures and do all they can to prevent repeating missteps. The wealthiest among us know there are very few things they do exceptionally well. They also know the role these skills and knowledge play in generating wealth. Being focused means sticking to your plan and not getting distracted by other opportunities or events that call for new and different skill sets. Determine the amount of wealth you need to live a life of financial freedom and meaning. Armed with that number, you can start to incorporate the Billionaire Money Rules yourself. Acknowledgment: This article was published by the BSW Inner Circle, a global financial concierge group working with affluent individuals and families and is distributed with its permission. Copyright 2017 by AES Nation, LLC. This information is presented for illustrative purposes only. There is no guarantee that any strategy or step presented in this article will result in the acquisition of any amount of wealth.